The Super 8s certainly heated up last weekend and there was some excellent football on show. There was serious drama, and wonderful scores, and games that went right down to the wire, and that’s what you want. We were first up with a tough away game against Roscommon in Dr Hyde Park. It’s a place that Donegal have struggled to get results in before, and the pressure was on because had we lost, we were out of the running, and weren’t going to get much benefit from our home fixture. Thankfully we got the result we wanted and the boys put in a big performance to run out seven point winners. It wasn’t the perfect display, but as I have said throughout the year, we’re a work in progress, and we’re striving to improve every day we go out wearing the green and gold. Any day that you get a championship victory on the road is classed as a good one in my book. I know Roscommon were well beaten in their first game, but they have still spent two of the last three seasons in Division 1 and are going to be back there again next year. They have a lot of good players that we needed to keep an eye on and we got the result that we were after. There was the possibility that a win wouldn’t be enough if Tyrone had defeated Dublin, but we couldn’t worry about that. We had to have our entire focus on the Roscommon match. We couldn’t impact on proceedings in Healy Park, but we could in Dr Hyde Park and we had to make sure we got the win, and that’s what we did. We went for a recovery session on the way down the road, and there were a few lads checking the score from Omagh, and by the time that we were back within the county borders, we knew that we had a humdinger with Tyrone in front of us in two weeks. By all accounts, there was a great buzz in Omagh last week with the Dubs in town, and I’m told there was plenty of craic in Roscommon on Saturday as well. It’s brilliant that these big games are coming around the country, and it’s a real shot in the arms for provincial towns. I watched the Tyrone and Dublin match on Sunday morning, and it was a really good game of football. Dublin got a goal at the start of the second half and it looked like they might kick on, but in fairness to Tyrone, they stayed in it, and had a free at the end to bring it back to one point. There were still a few minutes left at that stage, and anything could have happened, but Dublin showed that winning mentality again to grind out the victory, and time after time, they come out on top in close battles. That result sets us up with a mouthwatering decider against the Red Hands in Ballybofey. Tyrone suffered a blip at the start of the championship when they lost to Monaghan, but they have got back on track since that. Mickey Harte will have taken encouragement from their performance last week and they will come to Ballybofey with no shortage of confidence or belief. It’s going to be a great occasion in MacCumhaill Park and tickets are going to be as scarce as hen’s teeth. We had super support in Roscommon last week, and that meant it didn’t really feel like an away game. Hopefully our supporters will come out in their numbers again next week and bring loads of colour to the game. But don’t put off buying the tickets. Get your hands on them as quick as you can, and make sure we have plenty of Donegal fans in MacCumhaill Park on Sunday week. 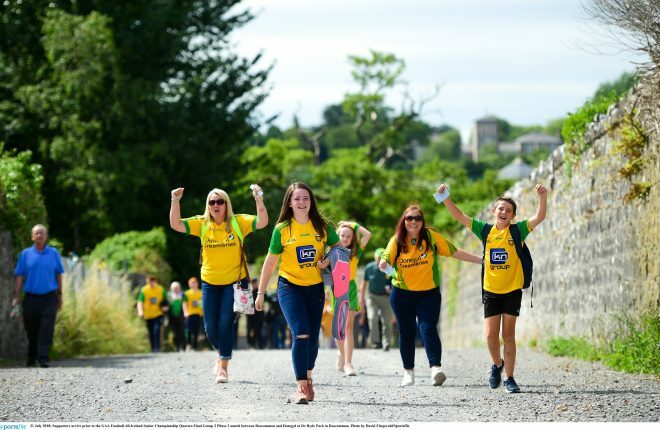 It was a weekend to remember for David Clifford as his late goal secured a draw for Kerry against Monaghan and kept the Kingdom alive in the Super 8s. I’m sure the GAA were thrilled as it looked like we were going to have two dead-rubbers in the final round of games in Group 1, but now there is quite a bit at stake. Galway are safely through to the semi-finals, and they came through a good test against Kildare in Newbridge last week. The loss of Daniel Flynn to a red card was huge, and to me it was a borderline call. It was always going to be tough for Kildare without their best player but they hung in right to the end, and just fell short. It’s funny how things go. If the qualifiers hadn’t been introduced, and Kildare had lost to Carlow, Cian O’Neill would have been out of a job. However, Kildare got a few good wins in the back door, and a couple of decent performances in the Super 8s. Their Under 20 team are in the All-Ireland final, and all of a sudden, they are coming team on an upward trajectory. Galway are motoring well and you have to hand it to Kevin Walsh. He has made Galway very difficult to beat, and they are up there as one of the top two or three teams in the country at the minute. They will aim to top the group and avoid Dublin at the semi-final stage in their final game, but they will meet a Monaghan team that need to win the match. The Farney county will be kicking themselves after last week, when it looked like they were on course for a famous win over Kerry. 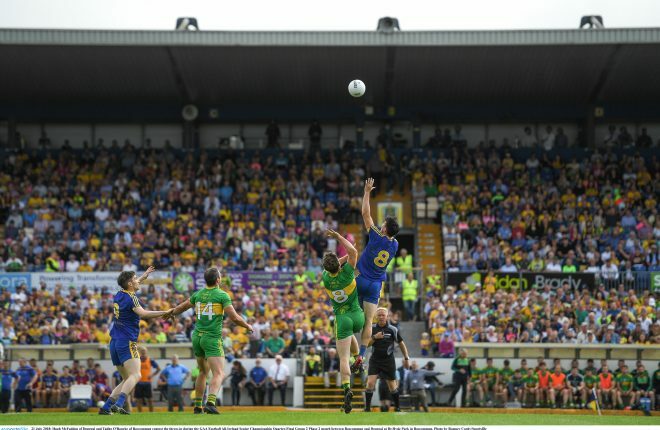 The Kingdom were heading out of the championship until one long ball was sent into the square, Kieran Donaghy tapped it down, and David Clifford supplied the finish through a crowd of players. Monaghan were minutes away from a semi-final spot, and now they have to go down to Salthill and get a result. Fortune was on Kerry’s side and they will fancy their chances of making the semi-finals now.